Six gorgeous, fun and classic nail ideas for your wedding day. Six bride-approved nail ideas for your wedding day. When it comes to your bridal look, there’s a lot of think about: your dress, shoes, jewellery and accessories – not to mention makeup and hair. 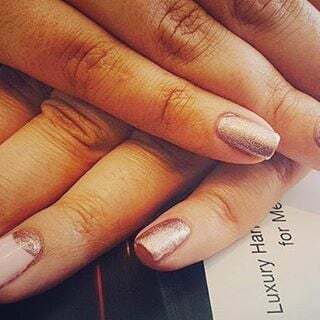 So, it can be easy to forget about your wedding nails until you’re at the salon being asked what you want and stumped for ideas. And that’s why we’ve put together the most stunning bridal nail ideas for your big day. Classic French manicure – with a twist. The classic French manicure – white tips over baby pink – has been seen on brides the world over, but it’s easy to take this classic wedding nails look from basic to next level. Simply ask your manicurist to apply the base coat and pale pink as normal. Then, while applying the white layer, take it further down the nail to halfway or two-thirds of the way. Next, comes a gold line to join the colours. Simply beautiful. For another take on classic bridal nail art- add some glitter polish (in a metallic tone that matches your jewellery) or nail gems – or both. Does your wedding have a tropical theme? Maybe you’ve gone for a doughnut wall instead of a cake because it’s your favourite food on earth. If there’s a motif or image you’re incorporating into your wedding it could make a great addition to your bridal nail art. They key is simplicity for this kind of occasion. Decals look better if they’re only on one or two fingers on each hand. This is one of our favourite nail ideas because it’s a little bit special, but not over the top. Creating this bridal nail art look involves alternating glitter nail polish with a block colour and stud or diamante. Bold colour – gem lunula. For a fun twist on classic nail designs for your wedding day, add gemstones or crystals. While a nice place for your sparkling addition can be down the side of your nail, for a different nail idea, try placing them on your lunula – the crescent moon-shaped part at the base of your nail. Our favourite nail trends of 2017.Source: Instagram/ @e.v_nails. Our favourite nail trends of 2017.Source: Instagram / @_lolonails_. 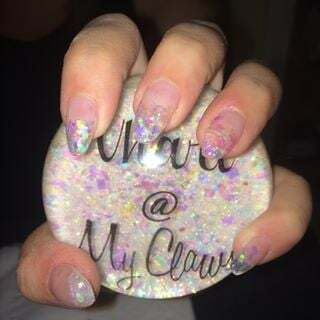 Pastel with glitter at the base. Our favourite nail trends of 2017.Source: Instagram/ @paulinails1. Our favourite nail trends of 2017.Source: Instagram / @nail_gongbang. While you may want to keep it understated with your makeup, wedding nails are a great way to have fun with colours. Try this colour splash bridal nail art design using colours that feature in your wedding theme. What would a list of nail designs for your wedding day be without flowers? While frangipani nail art can be sweet for a tropical wedding, you can make your floral detailing more subtle by incorporating flower stems and leaves. Try featuring the nail art on one or two nails, while painting the others a contrasting shade. What’s your favourite nail art look? Let us know in the comments section below.